Mother Teresa of Calcutta is now Saint Teresa of Calcutta. She was declared a saint on September 4, 2016. Her feast day is the day of her death--September 5th. 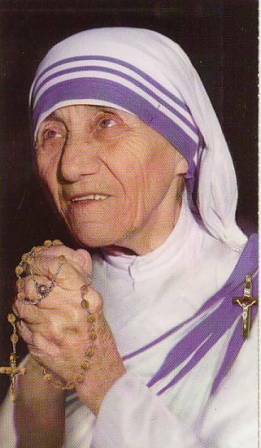 Many know that Mother Teresa of Calcutta loved and cared for the destitute and dying in the streets of Calcutta. Jesus spoke to her. He said, “I thirst,” …words He spoke from the Cross. He told Sister Teresa that His thirst was not for water, but for people to love Him and to be loved by Him. He asked her to reveal His thirst to the poorest of the poor. She was to show by works of caring that the poor were loved by God. Do you really know the living Jesus, not from books but from being with Him in your heart? Ask for the grace. Our Lord longs to give it. The hurts of life and sometimes your own mistakes may make you feel it is impossible for Jesus to really love you. Your past sins are to be new beginnings. God’s love for you is not conditional. You do not have to perform some great deed before He will come back. Actually He longs for you and misses you when you don’t come close. He will always accept you. He only wants to love you and to be loved by you. When you feel lonely, unwanted, sick and forgotten; remember you are precious to Jesus. Open your heart to be loved as you are. Bring all your suffering to Him. He will do the rest. Remember... the reason for Christ’s death on the Cross was to have you love Him. She also told us that there are Calcuttas in our own cities, towns and our own homes. They need our hands to serve and our hearts to love.